The latest issue of the EDUCAUSE Review features several articles about the concept of “change” in higher education; this introduction, written by EDUCAUSE’s new president and CEO, neatly summarizes the perspectives found in longer pieces throughout the issue. Some of the conversations in this issue capture the frustration, the sense of urgency, and the strong feelings involved when we talk about change. Whether expressing exasperation or evangelical zeal related to the way higher education has coped with or should respond to change, the voices accurately reflect our current realities. Strong feelings abound. And so do persistent questions. 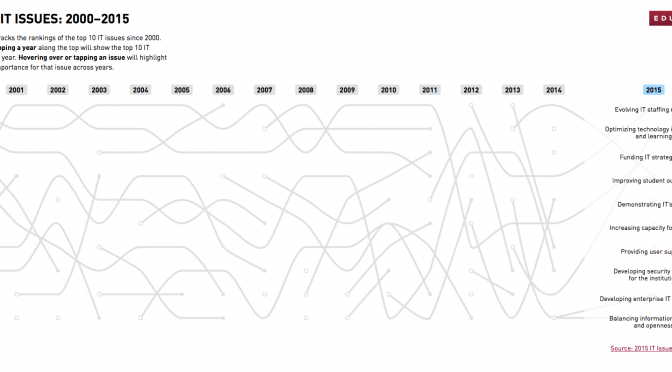 When does change find traction? When does it fizzle out? What models will prevail, and which will lose their relevance? John O’Brien. “Conversations About Change.” EDUCAUSE Review, August 17, 2015. This survey of faculty at U.S. institutions used both quantitative and qualitative analysis to determine current faculty attitudes about technology and learning. The vast majority of faculty are aware of relevant technologies, even if their pedagogy has remained traditional. Faculty say that proven student benefit is what drives their technology choices. But when it comes to actually integrating technology into the classes they offer, ease of implementation and the time involved are just as or even more important. Survey results tended to be flat when looking at all faculty. When faculty respondents were recategorized according to their general disposition towards technology, a different/clearer picture emerged. 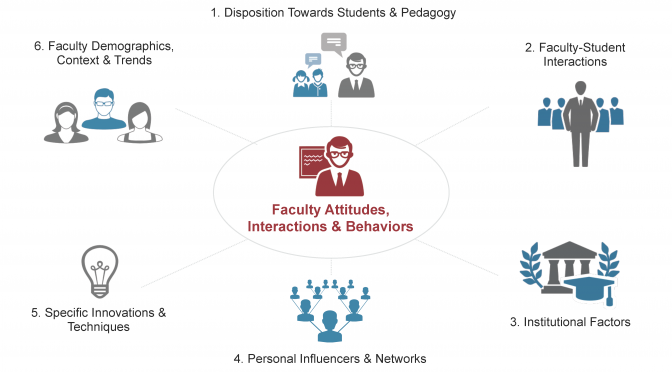 Faculty that are more student oriented and connected to their institutions are early adopters of many technologies, while research-focused faculty that feel disconnected from their institutions are most resistant. See chart below. See more at the EDUCAUSE archive page for the webinar event. A survey of virtual campuses various American universities have built in Second Life, which remain accessible but are no longer in active use. 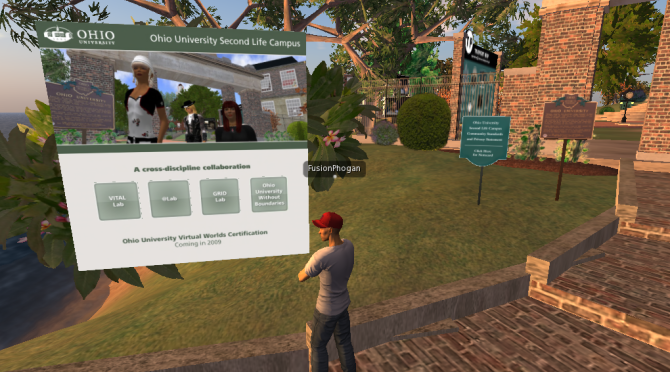 Ohio University’s campus greets you with an advertisement for its virtual worlds certification, coming in 2009. I couldn’t find any mention of this certification on the university’s website or through Google. Hogan, Patrick. “We Took A Tour Of The Abandoned College Campuses of Second Life.” Fusion, August 13, 2015. Tara García Mathewson, “With increased video use comes greater copyright concerns for higher ed: From the use of stock footage to audio clips, students and faculty face intellectual property concerns” EducationDIVE, July 29, 2015. The question for colleges and universities is what role they should be obliged to play in educating faculty and students about copyright laws in the first place. And then, as video becomes even more entrenched, what role should they play in providing a royalty-free catalog of content? This article points to the growing challenge of using video, and other digital media, by faculty and students at U.S. colleges and universities, while following the rules so that digital content is “fairly sourced.” Institutions and private companies are seeking ways to help faculty and students find and use digital media while meeting copyright and fair use standard. Hill, Marshall. “A More Uniform Way of Recognizing Online Degree Programs Across State Lines, With SARA As A Focus.” American Council on Education, August 2015. If we want distance education to play a substantial role in increasing postsecondary attainment in the United States, we need a better approach. The current process is too varied among the states to ensure consistent consumer protection, too cumbersome and expensive for institutions that seek to provide education across state borders, and too fragmented to support our country’s architecture for quality assurance in higher education—the quality assurance triad of accrediting agencies, the federal government, and the states. ACE’s latest “Quick Hits” white paper is an updated overview of the history, goals, and recent developments in State Authorization Reciprocity Agreements regarding online/distance education. Excellent national overview for anyone new to SARA. In addition to making this content available in PDF, ACE put together a 2.5-minute “visual brief” that presents the core points in animated format. Lloyd, Med. “Pairing E-Portfolios With Badges to Document Informal Learning.” Campus Technology, July 29, 2015. One of the greatest impacts of this initiative, added Ambrose, is the model it offers other campuses and institutions for collaborating with vendors to adjust technology to the education sector, rather than the other way around. 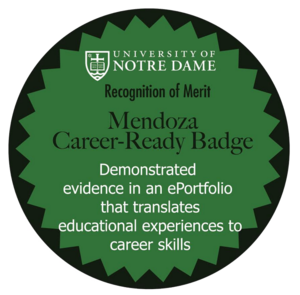 A summary of Notre Dame’s efforts to integrate digital badging into their student e-portfolio system. What began as an API hack is now a partnership with Credly and Digication to ensure student authentication and promote interconnected use of third-party services. They are investigating how to include the badges on transcripts.